Bound for the Snow not the Office! BusinessInspirationBound for the Snow not the Office! Yes, it’s time to hit the snow! Striding through the snow with your workmates? Collective thrills of excitement as you look down into the valley from the Eiger North Face? A team trip is more just a time for fun – the fresh air also transforms individual players into a real team. Winter has some very attractive teambuilding opportunities available in the canton of Bern – yes, it’s time to hit the snow! Eiger Vision is a company specialising in events for smaller and larger groups in the Alpine terrain around Grindelwald. 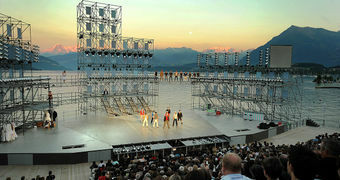 It organises activities that include glacier walks, climbing parties and the traditional Swiss sport of "flag throwing". Its most spectacular offer would be a visit to the north face of the Eiger. After a short train ride to the Stollenloch on the steep northern flank of the Eiger, expert mountaineers will attach you securely before you reach the light through the opening in the steep cliff wall. On the small platform in front of the Stollenloch you will inch your way as far as the abyss where you cast your gaze into the depths below. 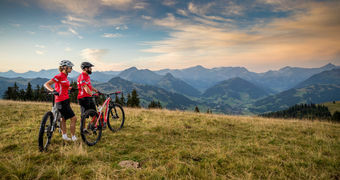 This offer by Jungfrau Tours is suitable for groups of up to 25 people who especially enjoy sporting activities where there is plenty of fun included. Participants wear snowshoes as they walk along the two-and-a-half-hour circular route from Grindelwald to the nostalgic skibob race track, which has long been out of service and is largely forgotten, and then back to the village. On the way, participants pass the former Köhlerplatz and the Gmeinmaad hut, which once served as an alpine herdsman’s hut, before reaching a comfortable ski hut where delicious fondues are served. Groups that would prefer a more modern experience can walk back to the village and enjoy a sumptuous platter at the Aspen Restaurant. The 4wellbeing company arranges customised events for groups of varying sizes in Adelboden. Teams can go ice fishing together, take a snowshoeing trip to the fondue igloo, or spend a day competing as a team at the Adelboden Winter Games. On the Engstligenalp the groups compete in the Snow Tub Relay, play snowshoe football, battle it out for every second on a horned sledge, or concentrate hard as they practice playing the glockenspiel bells. And after all the hard work is over, everyone gets together around a fondue caquelon under the icy igloo roof. Groups are absolutely spoiled for choice in Gstaad. How about a husky sled ride or a romantic ride to Lake Lauenen on a horse-drawn carriage? Or both? Husky enthusiast René Minartz not only organises unforgettable sledding trips but he also regales his groups with loads of fascinating information about the Siberian dogs. After the sled ride, additional modular activities can be added such as sipping mulled wine around a crackling fire and/or a romantic carriage ride to the renowned Lake Lauenen. No, those aren’t cows trudging through the snow on the snowy meadows at Les Prés-d'Orvin, they are bisons. These animals are the stars at Christian Lecomte's farm for, after all, they have influenced the design of the different rooms as well as the menu. In this delightful Wild West environment, groups can organise their day as they see fit. Winter options include snowshoeing or cross-country ski tours through the unspoiled countryside at the foot of the Chasseral. If you wish, you can get close up and personal with the bison under the guidance of an expert and learn all about these animals. The most unique attraction at the farm is the restaurant, where the meat of these wild cattle is served as the main course followed by rousing country-style music for dessert.